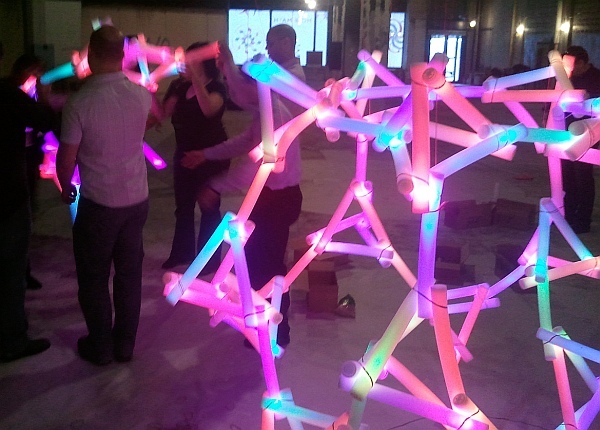 Inexpensive light sticks can be held together with rubber bands to make glowing geometric structures. Here’s a construction based on the truncated dodecahedron, with a tetrahedron over each triangle. Assembling it is a fun group activity. The design called for 170 light sticks, including the twenty which stick out from the tetrahedra. It came out pretty much according to the plan, with some strings to suspend it from the ceiling. This article first appeared on Make: Online, November 14, 2011.